By now, all of your house preparations for winter should be just about done, including storing your window screens until the spring. With the leaves mostly gone from the trees, you may notice more sunlight reaching your windows, which can be beneficial for solar heat gain. But is the view through your windows picture perfect, or is it clouded by dirty glass? Cleaning your windows doesn’t have to be complicated or a lengthy process. With a few household items, you can get them sparkling in no time. The simplest – and cheapest – window cleaning solution is made up of white vinegar, a little cornstarch, and hot water. Use one tablespoon of cornstarch for every 1/4 cup of vinegar, then fill your spray bottle to the top with hot water. Using a squeegee to remove the cleaning solution is much quicker than using cloths, and won’t leave lint residue behind. 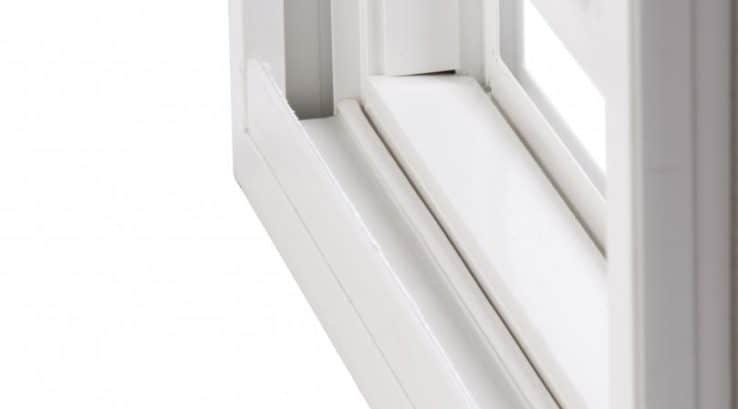 While you’re cleaning the windows, make sure to clean the windows sills and frames. Over time, the tracks that your window slides along can become encrusted with dust, pollen, and other debris, potentially making your windows open and close less smoothly. Again, vinegar comes to the rescue with its effective cleaning power. Remove dirt and build up from the tracks using a nylon brush or old toothbrush. If you have excessive build up you may need to break out the shop-vac. Then wipe the tracks with a cloth or Q-tip dipped in vinegar. Finally, wipe the entire length of the track with a paper towel or clean cloth. To clean your window sills and window molding around your windows, use a mild non-abrasive cleaner and a soft cloth. For wood windows, you’ll need to take greater care to make sure you don’t damage the wood or painted surfaces. Vinyl replacement windows are more forgiving, so you can wipe them down with a diluted vinegar solution or plain warm water. Once your windows, sills, and frames are clean, spend a little time on a regular basis maintaining them. That way, the next time you deep clean you won’t have to do as much work. Every week, give the window glass a quick wipe-down with a microfiber cloth and some of your vinegar solution. Your window sills and frames can benefit from a monthly wipe-down. Of course, you may have to increase cleaning frequency at times. Springtime will certainly deposit all sorts of pollen, seeds, and twigs in your window frames and outer sills. And if you have children or pets, then chances are they leave evidence behind in the form of smudges and fingerprints on window glass surfaces. I like how you talk about there being several different kinds of windows and that each and every one of them has unique functions. When it comes to double hung windows they’re usually seen as the most traditional kind of window that can be found on the outside of a house, which is easy to clean and at the same time safe to have around the area. If I had the chance to have double-hung windows installed at home then I would certainly try them out.